While the weather here still has a bit more to warm up before it truly begins to feel like Spring, small signs are starting to pop up everywhere, birds chirping out the window in the mornings, tulips in the local flower shops and direct to me from Vitabath two new products to put a little 'Fruity Fresh Spring in my Tub Time'! 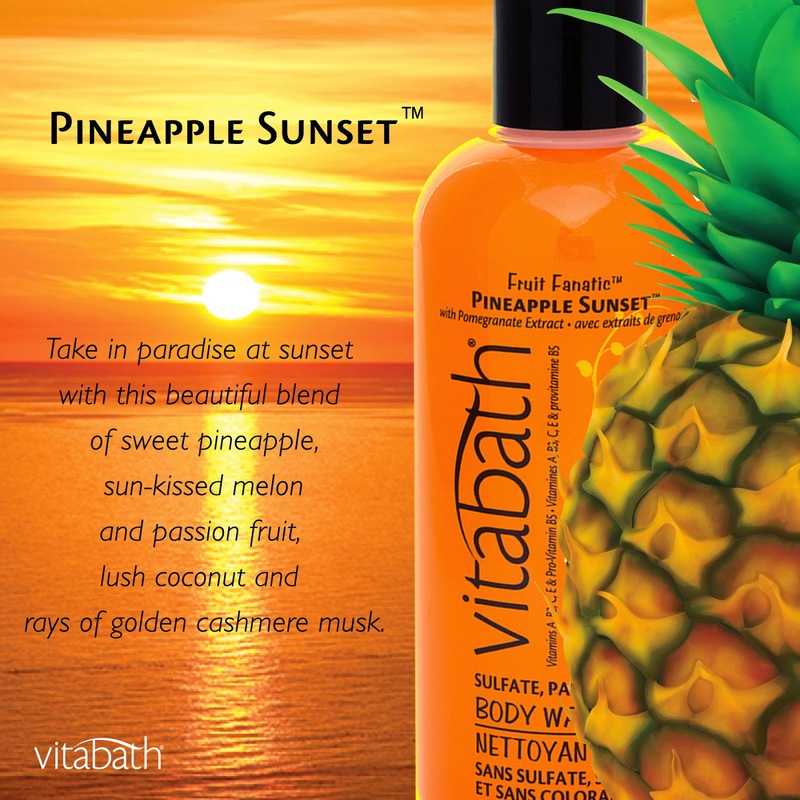 The folks who have been putting Vitamins, Nutrients and Anti-Oxidants in their bath products for 50 years and counting while always keeping it all free of harmful chemicals are hitting us with two new scents for Spring called 'Pineapple Sunset' and 'Raspberry Vanilla Velvet'. 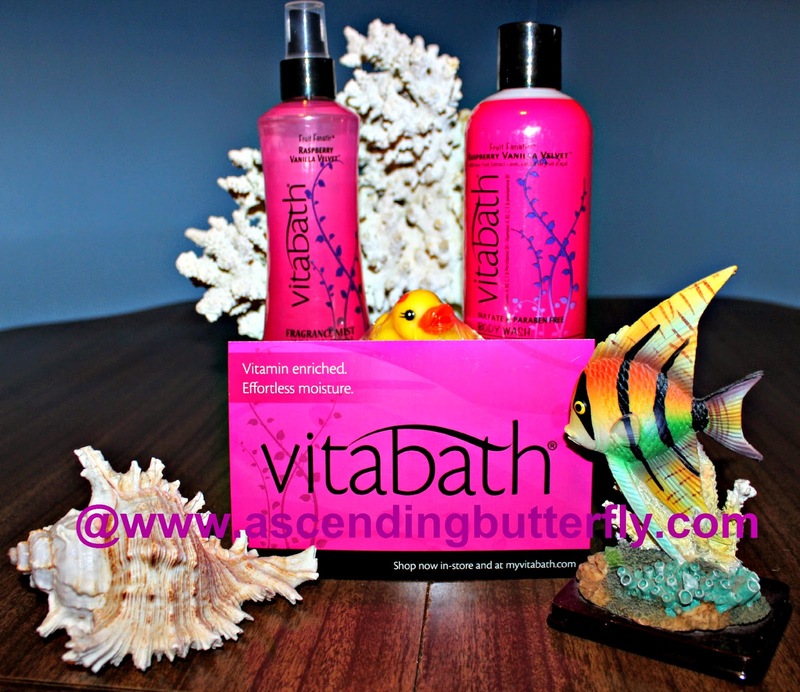 And if you are thinking 'butterfly that name sure sounds familiar' - (A) I commend you for your sharp memory and thank you for being such a loyal reader and (B) affirm that you are right, I met the Vitabath team in person at one of my favorite New York City Lifestyle Events, Getting Gorgeous! There were featured in my recap of Getting Gorgeous 2014 HERE. I am super picky when it comes to scents and my bath products. And while I normally keep all things 'fruity' contained in the tropical umbrella drinks I enjoy beach-side while on vacation, I am stoked to report that the 'fruity' in these new scents is actually subtle and not cloying sweet despite their sweet names. They both contain one of my favorite base notes in the perfumes I like to wear, the cashmere musk in the Pineapple Sunset and Amber which they use in the Raspberry Vanilla Velvet. I can also tell you it's a good Vanilla smell in that one also, I know most Vanilla scent lovers are very particular, this one doesn't dis-appoint. And I do love to layer so I was happy to have the duo of the Body Wash and Fragrance Mist. Use the rafflecopter entry widget below to have a chance of winning the Scent Duo (Body Wash and Fragrance Mist) of YOUR Choice from Vitabath! As always the first entry is easy peasy! Oh that pineapple one sounds fantastic! I love trying to bath stuff to escape in the tub. sounds like the perfect tropical escape! There are only a few places in Louisiana where they actually filmed :( "Fangtasia" e.g. is a club in California, and most of the houses are just set and not real. I was super disappointed to learn this! My girlfriend would love all of the fruity bath products. She's like you. She doesn't like her bath fragrance to be too powerful. I bet these smell amazing. Fruit scents are my favorite. Fresh Citrus twist moisturizing bath and shower glee has been my fav. but I'd love to try some of there new products. This certainly would be wonderful to have in the bath. I love these type of scents and the product packaging is so pretty to look at to. The raspberry one sounds amazing!! I can't enter the giveaway since I'm in Canada, but I'll check when I'm shopping to see if we have these here! I love fruity bath products, but I'm not sure what the ingredients of Vitabath are. I've always been interested in trying them. The Raspberry Vanilla is definitely more my speed. I always enjoy using bath products that leave me smelling fresh and clean. The anti-oxidants these products contain are an easy way to win me over! Raspberry Vanilla Velvet sounds amazing! It's a totally different combination than I've ever seen before. Oh I would love this! Vanilla anything is my favorite. I am a total freak for all things smelly! I would choose the Raspberry Vanilla Velvet. I love vanilla scents. I could definitely use a tropical vacation. SInce there isn't one in my immediate future, the Vitabath will tide me over. The pineapple sounds incredible. I would love to try either scent. They both sounds perfect for the spring season! I think I would like Mirabelle Plum because I like fruity scents. any of the scents sound good - I'd pick the pineapple over the raspberry but I love vanilla so I'm torn - what the heck I'd use them all! I think I would just love the scent combination of the Raspberry Vanilla Velvet. I've tried Vitabath Cucumber before and thought it was amazing, so I'm sure I'd love these too! I'd use the Raspberry Vanilla Velvet because it sounds decadent and amazing, and I'd love to smell like it! I am such a sucker for good marketing. I love the bottles and descriptions. Makes me feel like I can really smell it through the bottle. Fab products. Pineapple Sunset is the fragrance I want to try. This is the closest I will ever get to Hawaii. I would love the Raspberry Vanilla Velvet! It sounds amazing! Thanks so much for the giveaway! Black Raspberry sounds like a fantastic scent for me. 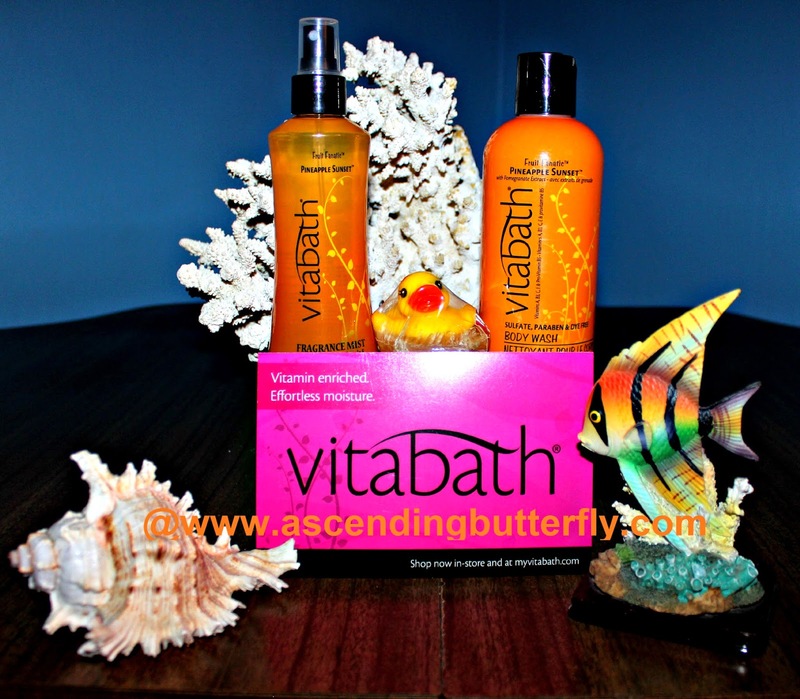 I love Vitabath it leaves my skin so soft. I'd like to try the Pineapple Sunset. I think that would remind me of summer every time I used it, and I love summer! These sound like products I would love to use. I am a an of bath and body products that smell fruity! Wow these products sound amazing. I wish I could smell them! I bet they smell amazing. I think I would also like the Vanilla one. Raspberry Vanilla sounds sooo pampering, I can just imagine a lingering soak in a tub and candles! They both sound fantastic...but I think I would love the pineapple the best. I would love to try the Rspberry Vanilla Scent!! I would choose Raspberry Vanilla Velvet. I like the scent of raspberry and vanilla so it would be a great combination.